In a workshop in Mahalingapuram, Chennai, a group of former fisherfolk, people who lost their livelihoods in the tsunami that followed the 2004 South-East Asian earthquake, are using their once-calloused hands for some very precise needlework. They are crafting suits. Not just any suits: These are for the Classic Bespoke line of a Savile Row establishment, Whitcomb and Shaftesbury. Yes, Savile Row, that so-called golden mile of tailoring in London’s Mayfair, playground of the rich, meeting place of the powerful, where the air is thick with wealth and the purring hum of gleaming black Daimlers is broken only by the clip of doors being opened, as wealthy passengers exit into the shops of Piccadilly and the softly lit interiors of private members clubs. Like those clubs, the tailors’ shops of Savile Row have deep leather armchairs and mahogany-panelled walls. These shops are portals of luxury, part of an alternate universe inhabited only by the wealthy and privileged. A bespoke Savile Row suit is considered the pinnacle of men’s luxury. Against this, suits made in India tend not to be associated with luxury, but with mass production and even sweatshop labour. Nevertheless, here they are, these former seafarers, and the suits they’re making will be sold on the Row. Remarkable, some would say. How did this happen? Whitcomb and Shaftesbury isn’t your typical bespoke suit tailor. For one, there aren’t—and never were— any Mr Whitcombs or Mr Shaftesburys around. The founders are Suresh and Mahesh Ramakrishnan, brothers, two of a set of triplets, born in a city then called Madras. Like many smart young Indians of the time, the early ’90s found them working abroad, in New York: Suresh, a Wharton MBA, worked as a Goldman Sachs investment analyst; Mahesh as a systems consultant with Sapient Corp. The standard Indian dream. But then, a decade ago, they gave all that up, to follow a new dream. They founded a small, traditional tailoring service in London, and named it after two roads that intersect in Mayfair. How did these South Indian brothers infiltrate this bastion of tradition—some would say stuffiness—of this closed world? If they had one initial advantage, it is that they came from the world of their customers. 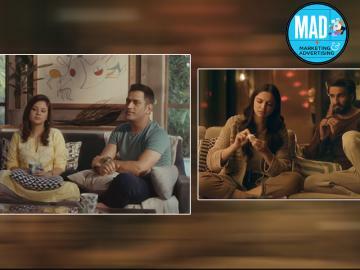 Mahesh concedes their background in the world of finance and marketing has helped. They knew how to access equity and had a pool of potential clients from their own network. They began by commissioning bespoke suits for them, building relationships with cutters, coat and trouser makers, some of the most renowned craftsmen on Savile Row. The relationship between a tailor and customer is often likened to that between doctor and patient, based on absolute trust. Step by step, they began to understand the Row and the flow of connections between different tailors. They negotiated this complicated world with aplomb. They were able to poach John McCabe, a renowned head cutter for over 40 years on Savile Row, taking him with them as director when they started their own business in 2003. In each Savile Row tailoring house, the head cutter defines and maintains its distinctive ‘style’, a highly political figure, in a world where so much is placed on ‘traditional ways of doing things’. Getting McCabe on board was something of a political coup. The firm soon had a client list that included American business magnates, Hollywood celebrities and Indian billionaires. Let’s step away from the Ramakrishnans for a moment, and get to know the Row. The tailors there are a fierce bunch. Accusations and jealousies slip from the lips of rivals, revealing ancient snobberies and deeply entrenched hierarchies. Many are in their fourth, fifth, even sixth decade of employment for the same tailor. Yet, there are often movements between them as buyouts and new management cause artistic temperaments to flare. There is an almost cultish devotion to style that different tailoring houses use. A bespoke suit costs upwards of £3,000 and is distinct from either ready-to-wear or made-to-measure for several key reasons. Standards set out by the Savile Row Bespoke Association (SBA), which is seeking geographically protected status for Savile Row, include that a bespoke suit be cut from an individual paper pattern made by a Master Cutter (who serves a minimum five-year apprenticeship), that at least 50 hours of hand labour go into each suit, that it be made from a choice of over 2,000 fabrics and that it must be made on Savile Row or nearby in surrounding Mayfair—preferably no more than 50 yards away. For many, though, ‘bespoke’ is just a word. A glut of e-commerce sites use the Savile Row name to sell machine-made, ready-to-wear or custom-made suits for a few hundred pounds. 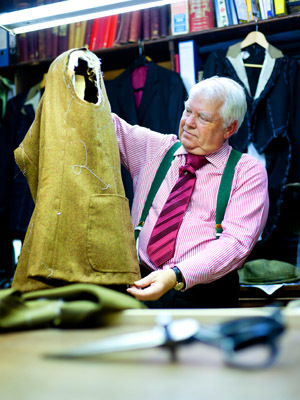 One man deeply concerned with the question of provenance and Savile Row is Mark Henderson. In 2004, he helped found SBA (and is its associate chairman) to preserve traditions of bespoke tailoring. SBA promotes a set of standards aimed at protecting the heritage of bespoke suit-making. Henderson is also deputy chairman of Gieves and Hawkes, which has its shop at No 1 Savile Row. Henderson is adamant that Savile Row depends upon its geography. On the Row itself, not all of what is sold there is made within its environs. One of the key areas of expansion for many brands is ready-to-wear and made-to-measure suits that are made in Italy, Eastern Europe or further afield, some even have licences with tailors in China to produce their suits, yet they continue to depend upon the association with Savile Row for their marketing. So, can Savile Row suits be made elsewhere? This is a difficult question. Henderson concludes that Savile Row is about place, its heritage and ways of doing things. He speaks of his admiration for the tailors’ shops he saw on a recent trip to Mumbai. But for bespoke, he says, the 50-yards rule remains. Other challenges exist too. There has been a consumer shift to the idea of unique hand-made luxury. Savile Row has found a new audience with a younger generation of customers, keen to experience bespoke tailoring, but wanting more affordable pricing. Savile Row faces the challenge of protecting its bespoke heritage while adapting to changing markets. The SBA sees the way forward as a tight, geographically bound definition of bespoke. This raises many issues. What is provenance? Is it place, people, a tradition or heritage or all these things, and how should it adapt to changing times? The brothers Ramakrishnan are finding their own balance, treading a tightrope of tradition and innovation. Their ‘Savile Row Bespoke’ range is made on the premises in London, in keeping with the idea that bespoke must be supported by tailoring no more than 50 yards from the Row itself. But what is different about what the Ramakrishnan brothers offer is their other range, their ‘Classic Bespoke,’ which also offers completely hand-made bespoke suits made to the highest standards. Like bespoke suits, each is cut in London to an individual pattern based on measurements taken from a fitting with the customer, and each suit involves over 50 hours of hand labour. But that labour is 5,000 miles away at their workshops in India, with communities in Tamil Nadu who had been displaced by the tsunami. And these suits sell at around half the cost of a suit made on Savile Row—around £1,400 instead of over £3,000—with a large percentage going directly to rehabilitating the communities who produce them. The Ramakrishnans emphasise that what they are attempting in India is not about being just another global production chain or sweatshop. They give the Indian workers they train a craft which has the potential for career structure and promotion. 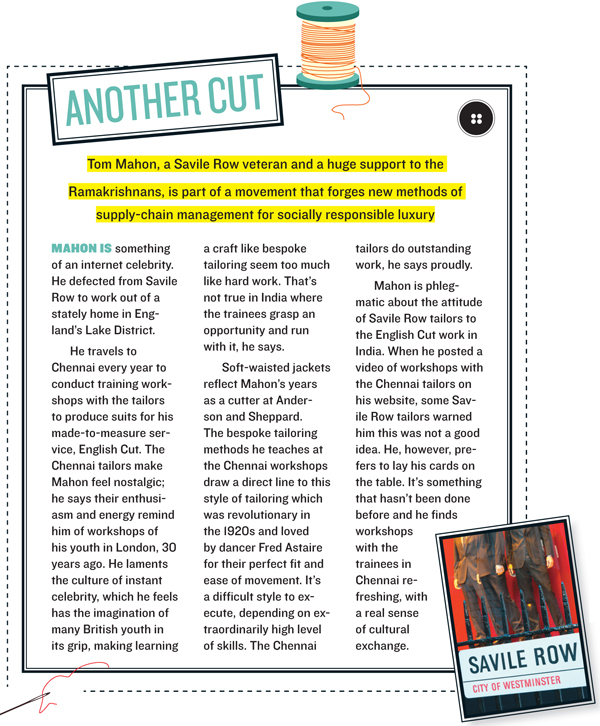 Mahesh oversees production in Chennai and reflects how hard it can be to train individuals in a world so removed from that of Savile Row. It’s a long process and constant encouragement is needed. Trainees must complete a demanding three-year certification programme after which they’re apprenticed to master craftsman, receiving all the entitlements one would expect of employment in a top financial company. Everyone gets a stipend while undertaking the training and, if they go on to work as fully-fledged tailors, they get benefits such as performance bonuses, company shares, medical support, education for their children and microfinance loans for buying homes. The Ramakrishnans have a new plan to expand their business through licensing made-to-measure to small tailors throughout India, building a network that would create a more thriving business and enable them to take on more trainees. 50 yards? 5,000 miles? The definition of bespoke is bending to new rules of the game. For Mahesh and Suresh Ramakrishnan, the social entrepreneurs of Savile Row, what matters equally is that the heritage of the Row should be preserved while the disadvantaged get a chance to flourish. I am very proud to be an aunt of Mahesh and Suresh. It is so heartening to see that in this day and age , two of our Chennai boys are looking beyond lining their pockets and finding time to care for the less privileged. Way to go Mahesh and Suresh! Global Sports Industry Outlook: Is Growth in this sector sustainable?